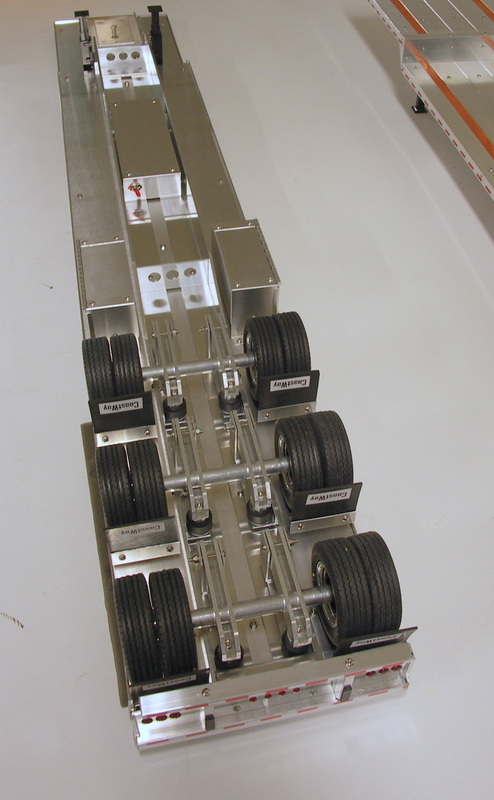 53′ X 102″ scaled Tri- Axle drop deck trailer . 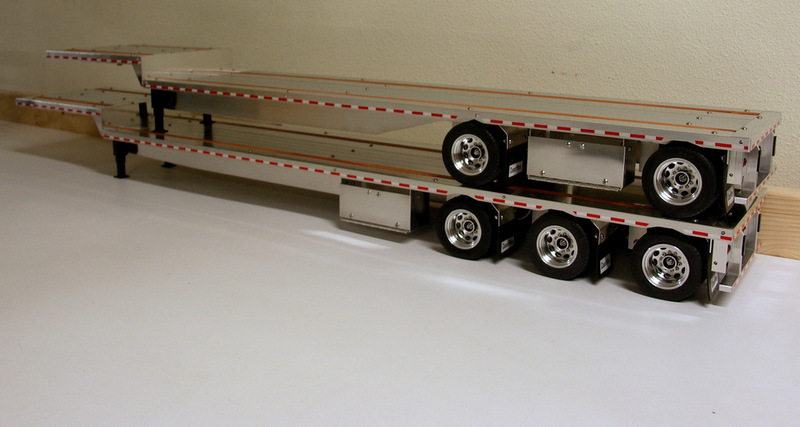 This trailer is 47.25″ long. Featuring aluminum construction and spring air bag simulated suspension, just like the rest of my trailers. The pictures below are older and the current trailers have been updated to include hubcaps and 2 red lights on the side in the rear instead of a yellow and a red. The pictures above are current. A strong drop neck area to handle to big loads. Just finished this trio of trailers, 2 of them are 53′ tri axle drop decks and the other on is a 48′ flat deck with winches. Contact me at darnat2@gmail.com if interested in ordering a trailer like one of these or to get pricing. Hi there, absolutely love your work, works of art! Could you please send me pricing on this trailer and also weather or not you can do quad/lift axle? Can you post to Melbourne, Australia? Thanks in advance, Anthony. Hi Anthony, The shipping is the problem, USPS Priority doesn’t go to your area and UPS is $835.00 just for shipping, I have shipped one trailer to your area and customer paid $750 shipping. Thank you though for inquiring! How much for the 53′ drop deck tri axle trailer with tool boxes? Hi Alex, I am sending you an email, thanks for the interest! How much is the 53 drop deck triple-axel, shipped to Gold Coast? Are you producing and selling these? Is so, could you tell me the price? 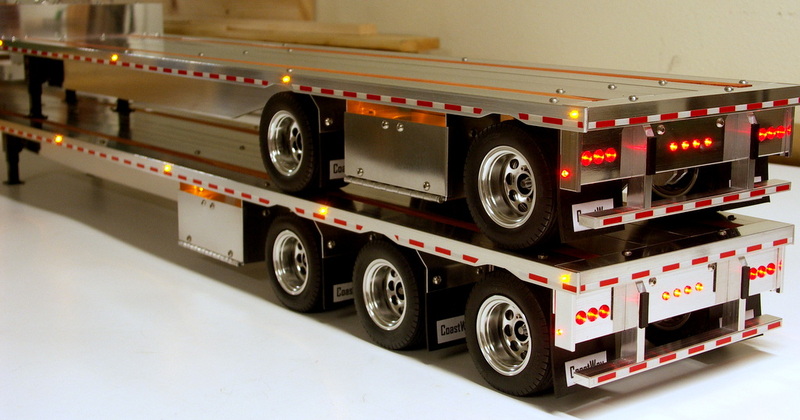 And do you make double/triple axle dollies to go with these trailers? 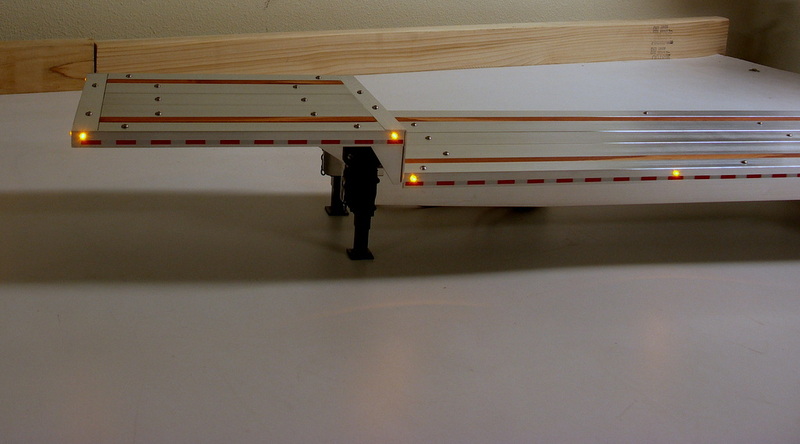 Yes I am building the trailers, I am not currently building any dollies. I will send you an email. Thanks Bud, I sent you an email. Love the 53 foot. Could i get a price? Hi Darwin, fantastic trailers that you make they are amazing. Workmanship is perfect. You must really love what you do. 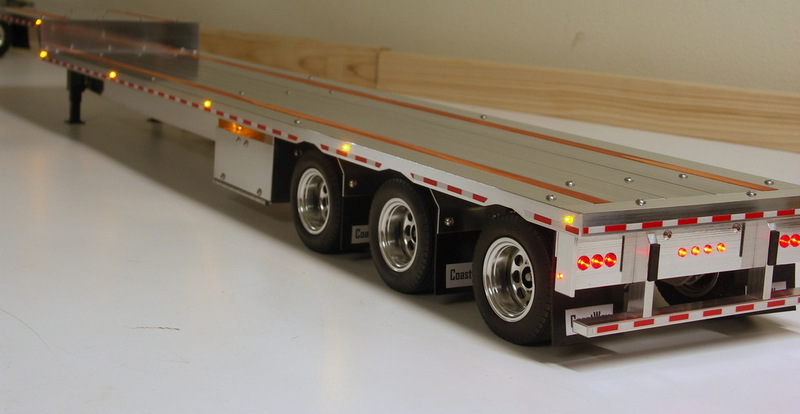 Could I get a price on one of your 53′ drop deck tri axle trailers please. My big boy who’s 8 has been saving for 2 years and has finally brought himself a grand hauler which I built up for him and I think one of your works of art would be the perfect finishing touches to his pride and joy. His birthday is in June so I would love to have something by then. Thanks very much Tony. Awesome, I will email you. Thanks! Hi Harry! I will send you an email, I appreciate the interest. I would like to be put on the list once you start building these beautiful trailers again. Hi Brandon, I appreciate the kind comments! I will send you an email. I am taking a break from trailer building once I finish my current orders, I am moving out of state and will resume building this Fall. Appreciate the interest! The Super B was a one off build, not planning on building any more of those. I sent you an email on the 53′ drop deck. Just checking in. I sent you some photos of the custom enclosure for the top, not sure if you are interested in a turn key fab or selling a base trailer. Either way I am still very interested in getting one as soon as possible. Hello I would like to order one of your trailers for my truck. Can you please get in contact with me. Thanks Susan, I will send you an email. Great, I always like pictures! I am sending you an email. Thanks! I hope that you had a good summer, I had inquired about buying a triple axle drop deck back in January and you had said that you were taking time off from building for awhile. Now that the summer is almost over are your order books open again? I don’t mean to pester you but my company has its own small trucking fleet and we want one of your models as a display for trade shows. I have looked all over the internet and no other model even comes close, and we don’t want to settle for a second rate display. Darwin, your work is so meticulous I am absolutely blown away! Talk about attention to detail. It looks like you’ve been taking some time to catch up, how long is your waiting list looking at this point? Regardless, please put me on as I am an avid collector and will hopefully have saved up by the time you’re ready 🙂 True artistry. Thank you for your work! Please send an email with any updates/ info and keep up the awesome work!! I have a few questions, Will you be making the 53′ drop deck to sell? and if so would you send out the framerails so they could be colormatched to my trucks paintjob? I love the 53′ triaxle. It looks like you are not building these to sell? If you do let me know! I will build more in the future and will definitely let you know when one is available. Thanks! 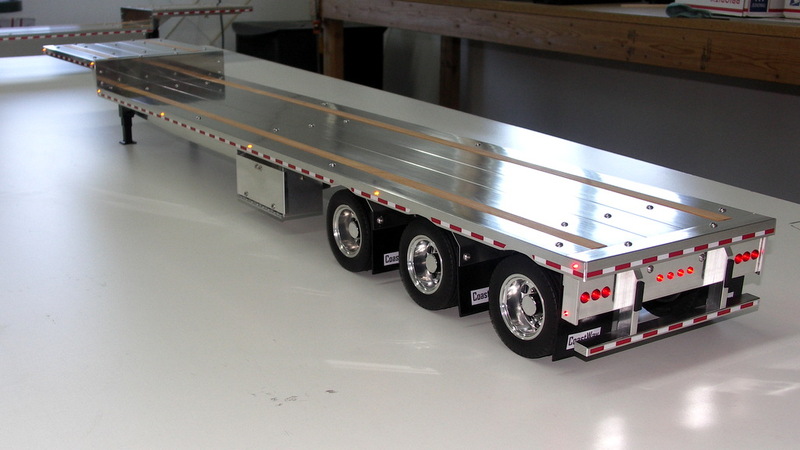 Dear sir I would like to purchase one f your 1/14 Custom Aluminum Flatbed Trailers, 53′ tri axle so if you can inform me how to get in touch with you and learn more about your prices, thanks. Darwin, I would select the rear tail light style with the lights right across the back. That is a customized look and sharpe. Thanks Scott, I like that one also. I want to build a Super-B train set with those lights on the pup. I will build a Super-B hopefully in the next 3-4 months months (once I get caught up :). It looks like it will be around 57″ over all length for both the lead and pup trailers, should be interesting. Darwin, These are unreal. I love the 53 drop. I am a big collector of heavy haulage. Reading your blogs you said that you will be sticking to the drop decks and flat beds. 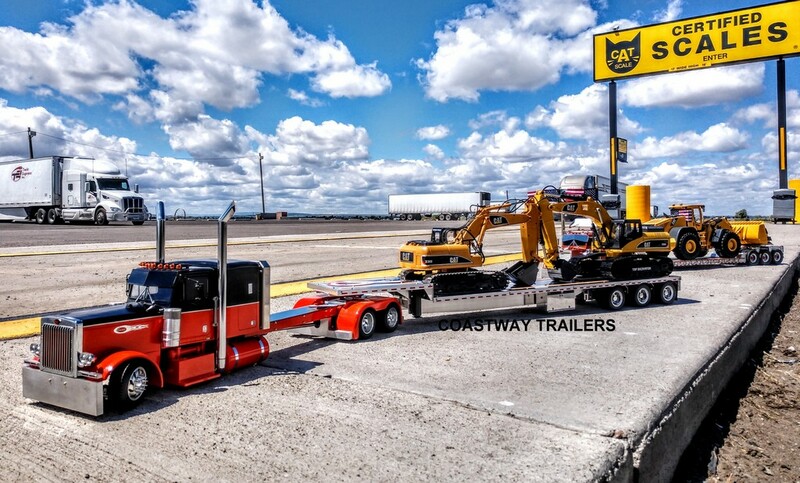 Do you have information on different sites that make lowboys. But I do want to be on your list for a 53′ drop trailer. So when ever you have one, just send me an email. I sent you an email also regarding the 53 drop trailers. 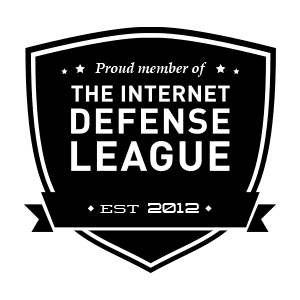 I just came across your site today and am very impressed! 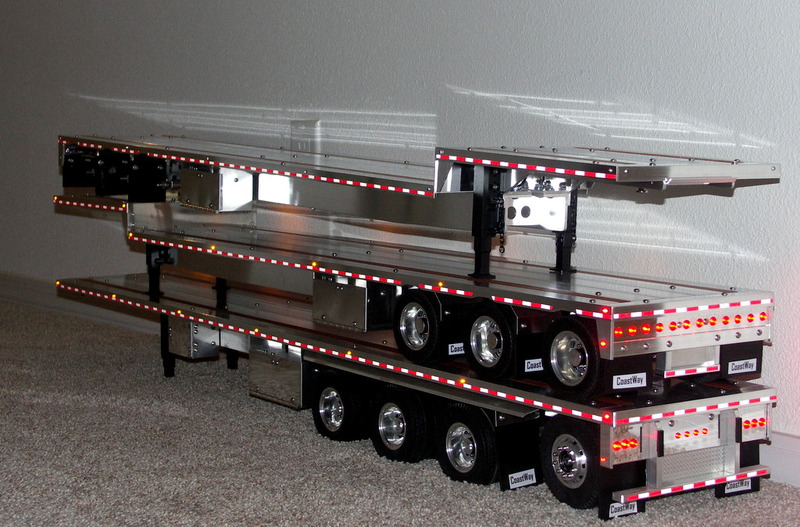 If you decide to build some drop deck tri-axle trailers, I’d certainly like to be on the customer list. Also, if you decide to do a lo-boy, let me know. Thanks for the praise! 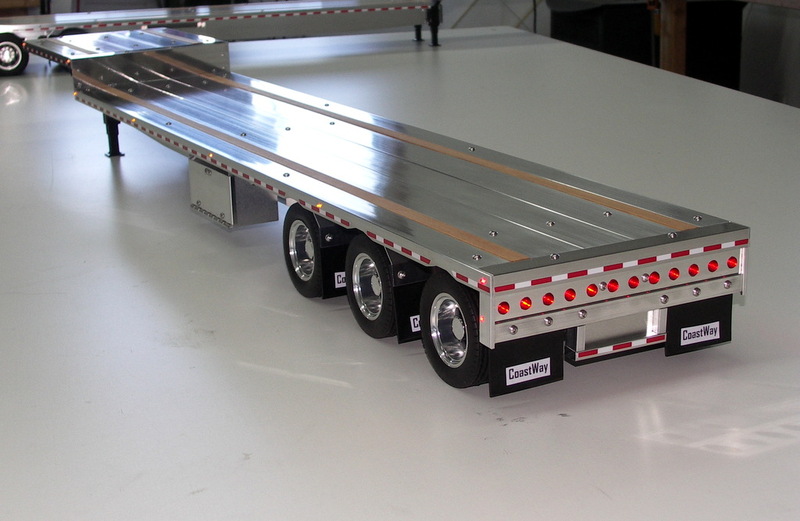 I will for sure keep you in mind and I may very well do a couple more tri-axle drop decks next year. As far as my prices being set, no they aren’t set, they can always go up! 🙂 Yes, start saving your “food stamps” lol. Thanks again, and check back with me in Feb. or March. Have a great December! 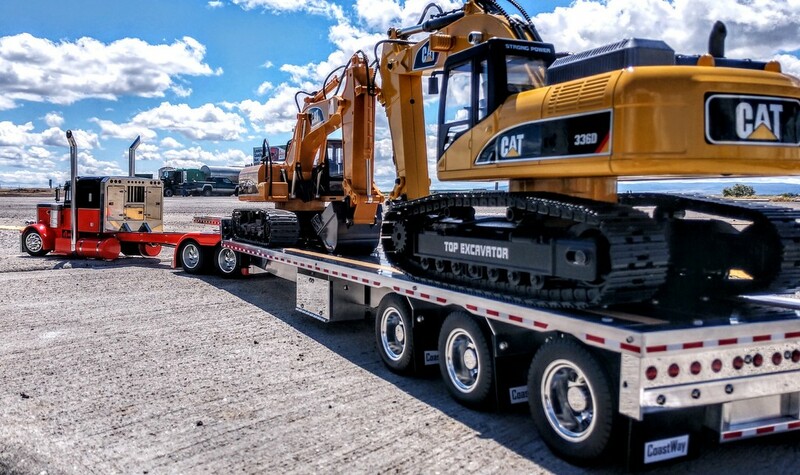 Nice looking trailers, I would interested in the 53′ drop deck tri axle with the light confirguration of the first picture. if you ever get round to building more. 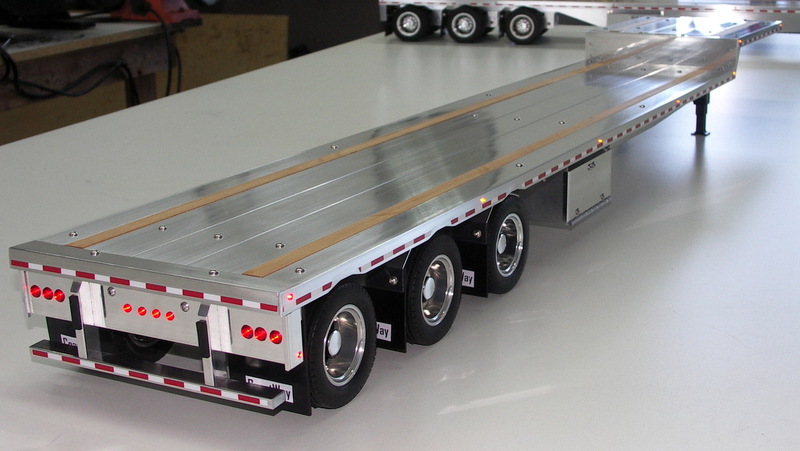 I will let you know, if I do build another 53′ drop deck tri axle you will be the first to get one. Thanks! I will add your name to the list Floyd. Sure I know what you mean, in fact most of the hay haulers around here use outside rail trailers. 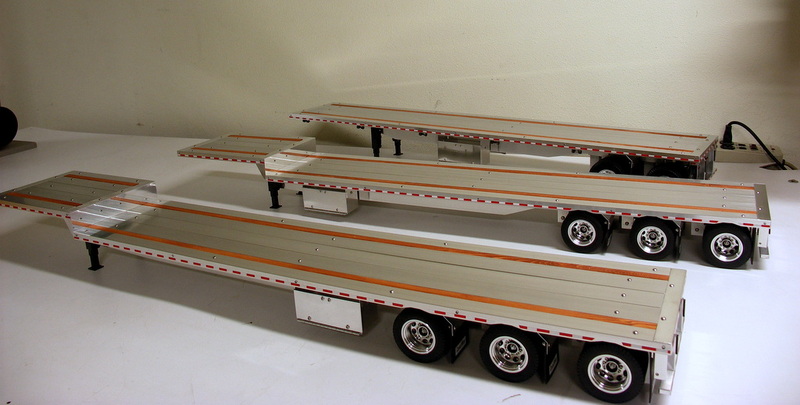 Western Trailers still makes new outside rail trailers. All of the trailers I was around in the early 70’s were outside rails. Maybe I will make one someday. Thanks Floyd! 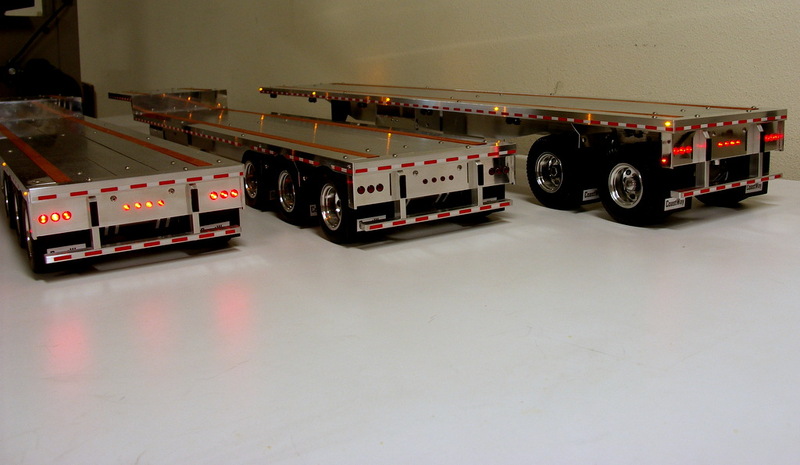 Well as far as the detachable lowboys, there are several builders who make nice lowboys already, so I think I will stay with the flatbeds as that is where the market was lacking. 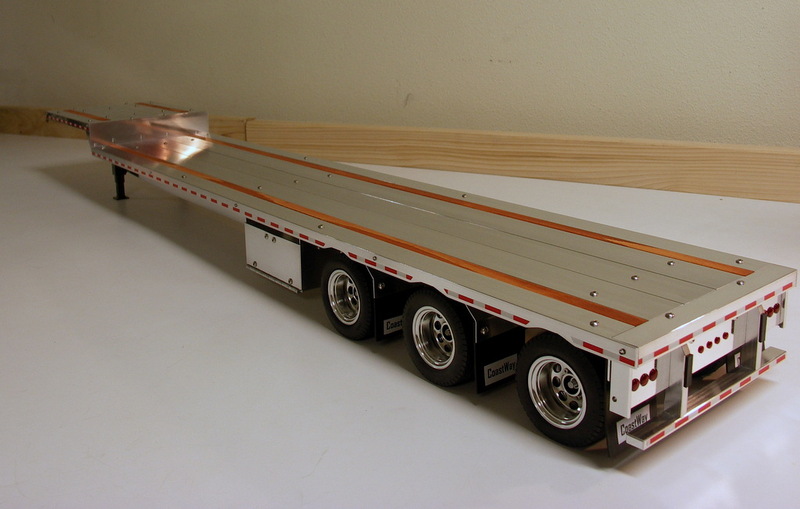 No one was making a realistic looking flatbed and drop deck trailer. So you do want me to put your name on the list? I will be happy to, your looking at early January since we have been in the middle of moving to a new place and getting settled, and with the holidays coming on. Thanks again Floyd! If your going for the realism i think the first one has more detail then the 2nd one just because you see them on the real roads. But you dont see show trailers to often ,but when you do they look wicked like that one. Man the tri axle is off the hook! great job!! Wish my check book was deeper for a Tamiya Cascadia and another trailer! 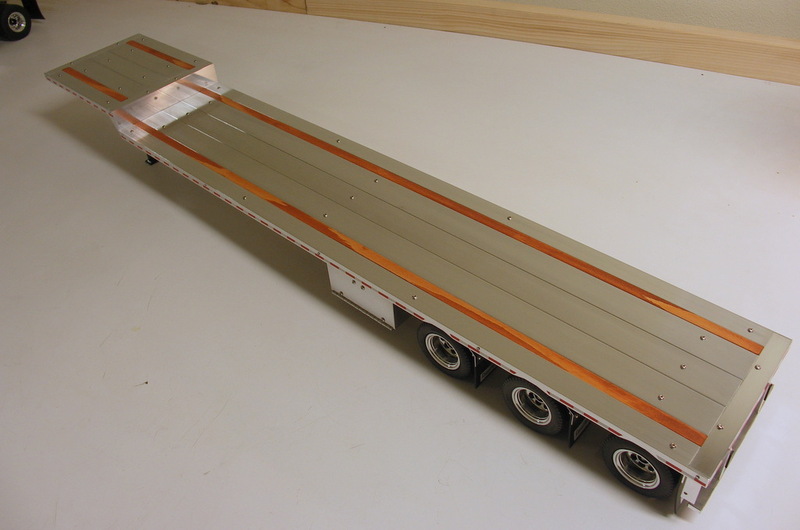 Hi when will you know the price of the new tri-axle drop deck ? and how long to build one ? Someone emailed me to ask the what the color of this paint I used is called. It is from a 2008 Porsche 911 called Macadamia Metallic.